Freedom of expression, the cornerstone of a democratic society, is under attack in Canada, the United States and internationally. Anti-terrorism legislation and police crackdowns on dissent and protest are undermining civil liberties. Media conglomerates are eroding journalistic independence, and corporate donors are challenging academic freedom. In this book respected contributors from Canada, the United States and Europe share their experiences with the suppression of non-conforming views and analysis. 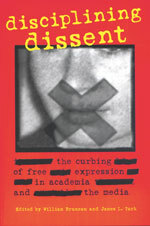 They examine the many issues associated with the increasing restrictions on free speech in the media and the academic world. They discuss and give examples of the effects of new corporate management practices, the suppression of dissent in the name of fighting terrorism, and the shrinking commitment to a diversity of voices. They discuss what needs to be done to reclaim the integrity and independence essential for media and universities in a democratic society. Among the contributors: David Healy, Director, North Wales Department of Psychological Medicine, University of Wales and author of Let Them Eat Prozac; Aidan White, General Secretary of the International Federation of Journalists, which represents more than 400,000 journalists in over 94 countries; and Jon Thompson, Chair of the Olivieri Committee of Inquiry, University of New Brunswick.